Debates happen from time to time over which is more important for self-reliance… gear or skills? With our emphasis on developing Doing the Stuff skills here, you probably already know my position. But, then again, you may be surprised. Both skills and gear are essential to self-reliant living! Modern gear is not evil. Neither are primitive tools. Every primitive skills practitioner, prepper, homesteader, and woodsman needs tools. It has something to do with opposable thumbs. Tools wrapped by skilled thumbs are capable of making gear. For instance, take the modern backpack. They’re constructed with state of the art material and built with internal frames. They’re designed to haul loads comfortably over long distances. My Osprey pack has many convenient pockets, pouches, and bells and whistles. But what kind of burdens can you carry with modern internal frame packs? Clothing and camping stuff mostly. 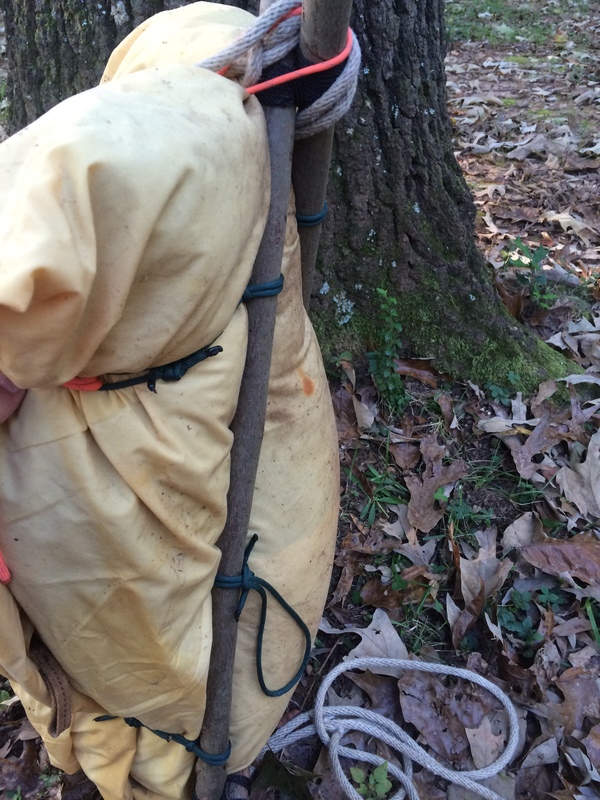 Try carrying a load of firewood back to camp or a quartered deer with an internal frame pack. They’re pretty one-dimensional. People all over the world have been using crude A-frame packs to carry heavy burdens for thousands of years. Otzi The Ice Man used an external frame pack over 5,000 years ago made of a bent sapling. Though his was not an A-frame style pack, an external frame can carry odd-shaped loads that modern internal frame packs can’t. Let’s get started. You’ll get to use knife skills, knots, and lashings to make your own. The Roycraft pack frame was named (not self-named, btw) after Mors Kochanski’s friend, Tom Roycraft. 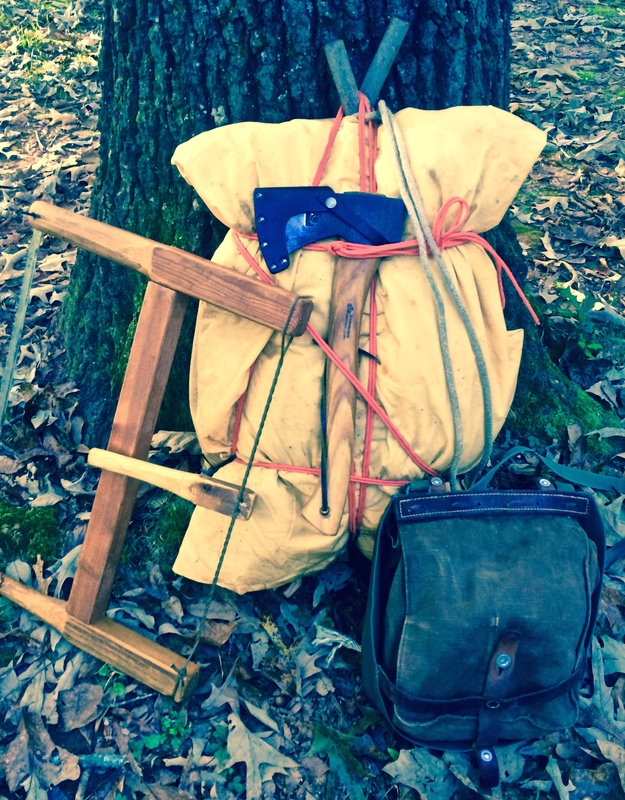 Mr. Roycraft, a survival instructor in the Canadian military in the 1960’s, used the time-tested idea of using 3 sticks and cordage to teach downed pilots how to construct a pack. The simple idea was adopted and used successfully. Upright Poles: Harvest saplings that are straight and thumb-size in diameter. 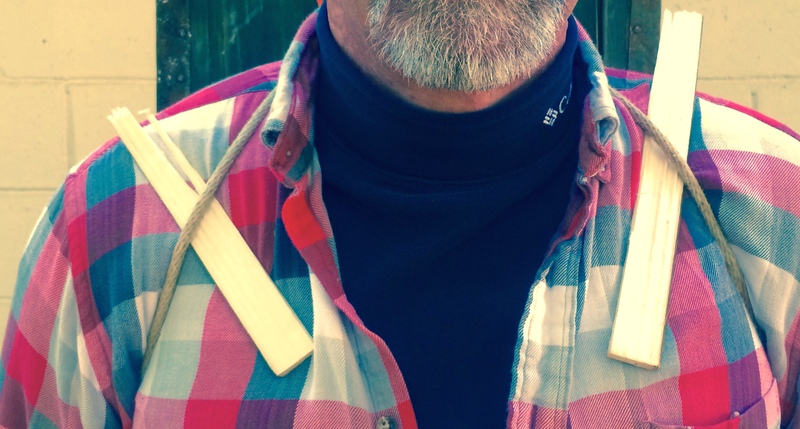 For the uprights, cut two sticks that measure from arm pit to finger tip in length. Stripping the bark from the poles will help preserve the wood but isn’t necessary. Lumbar Pole: This stick should measure from elbow to finger tip. Try to find a stick that is slightly curved to conform to your belt line. However, a straight stick will work. Start by using a tripod lashing on the two uprights. Place the two uprights together with the bottoms even. Begin lashing about three inches from the top of the poles. When done, spread the two apart to form the A-frame. Check out our video tutorial on how to lash a tripod. You’ll only lash two sticks though. 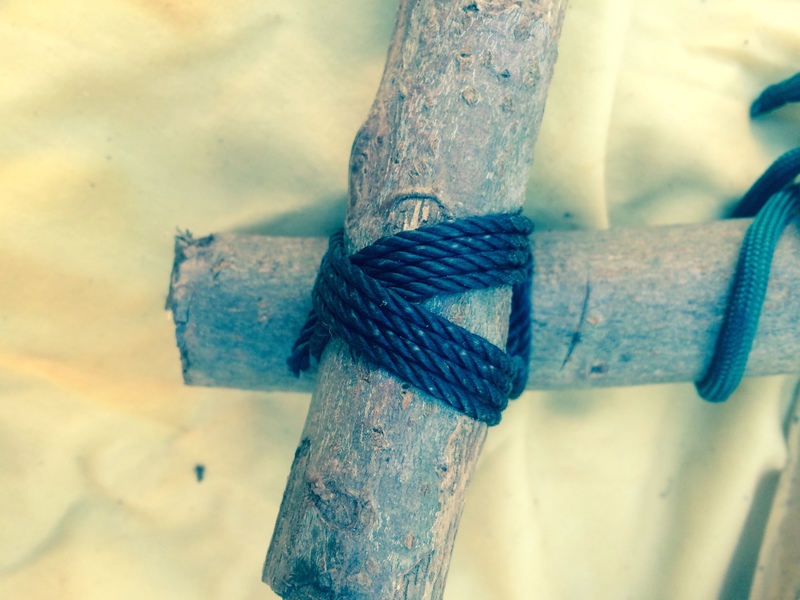 Lashing with natural cordage may require a butterfly notch at each intersection. Place the lumbar stick on top of the uprights so that the bend is protruding between the two uprights. Make sure you have about an inch and half of overhang at each intersection of the lumbar and uprights. The intersections will not be perpendicular. 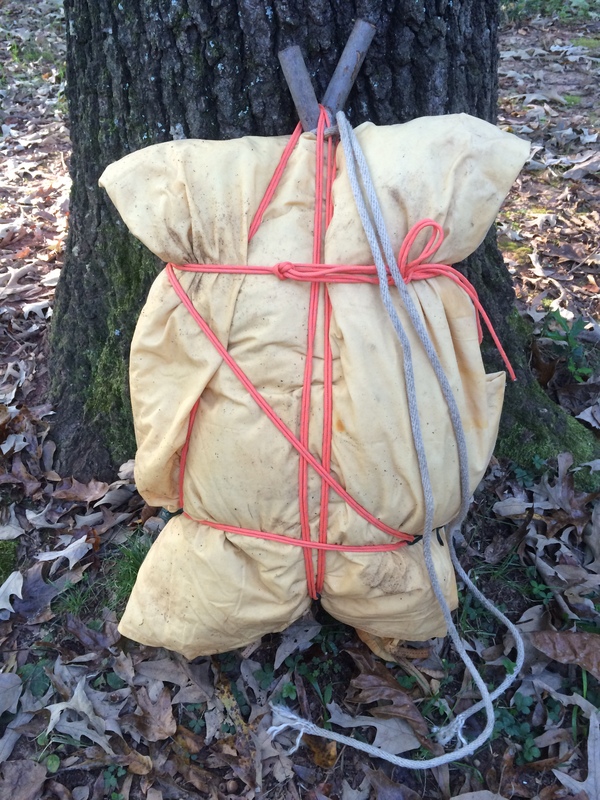 Use a square lashing or diagonal lashing to secure the lumbar section to the upright poles. I used a square lash on one and a diagonal on the other just for practice. 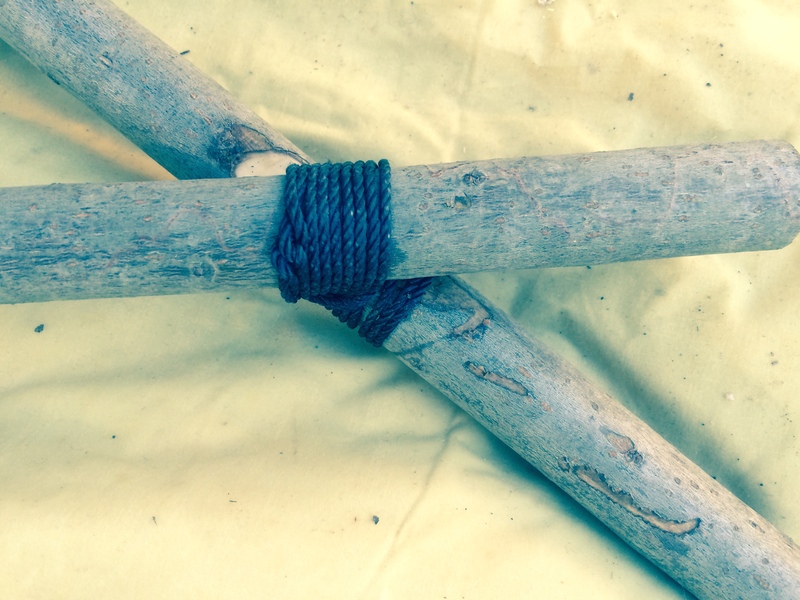 Learn to tie a square lashing here. I’ll have to do a diagonal lashing tutorial soon. Loops of cordage are multifunctional. 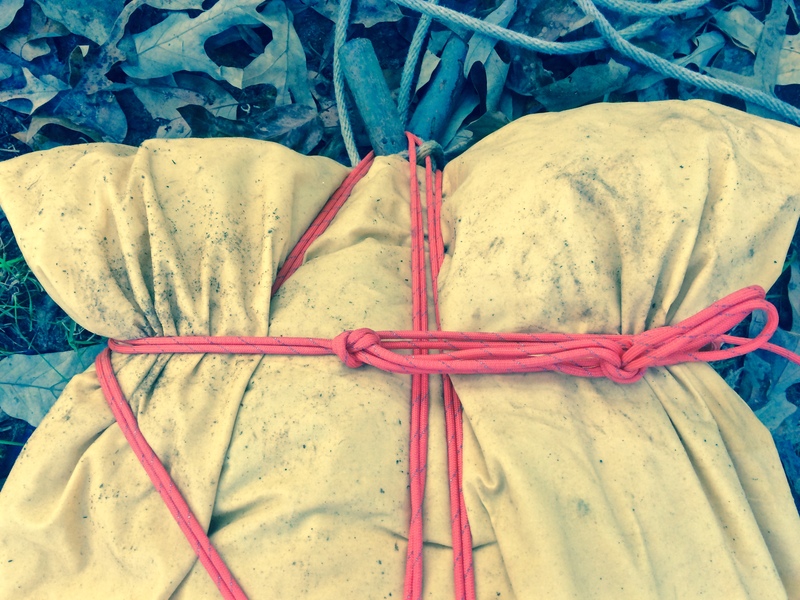 Besides being handy tie-outs to secure loads on the frame, the loops can be used to set up a tarp shelter. You can check out my first video how I set up an emergency 5 minute shelter. 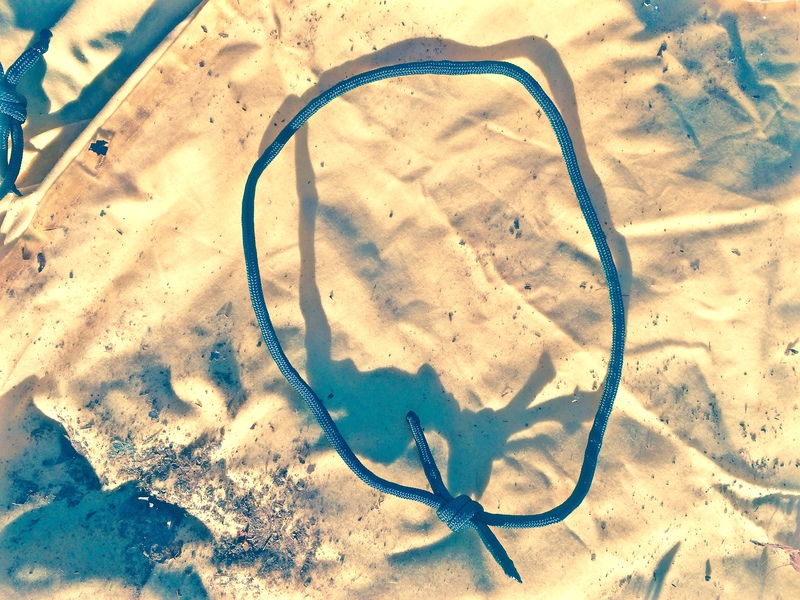 To make quick-release loops, cut six pieces of cordage 18 inches long. Tie a blood knot in each piece of cordage. This knot is easy to untie after being cinched tight. Attach each loop with a larks head knot; one on the lumbar pole, two on one upright, and the remaining three on the other upright. The larks head knot is easy to adjust on the poles depending on where you want the loops placed. Cut a piece a rope three double arm-lengths (from outstretched finger tip to your other outstretched finger tip). One of my outstretched double arm-length is about 6 foot – X3 – equals about 18 feet. I used a piece of 3/8 inch rope from my strap/rope box in my shop which measured about 16 feet. Note: If you use natural rope like hemp or manila, you’ll need to add whipping to the cut ends to prevent fraying. Double the rope evenly to form a loop in one end. Thread the loop under the top A-frame intersection from the inside of the frame. Tie a larks head by inserting the working ends of the rope through the loop. Work the knot tight so that the two loose ends are going through the top of the “V” on the pack frame. Lift the empty pack frame onto your back with the lumbar support at or slightly above belt height with the ropes over each shoulder. Reach back and wrap one rope around the upright and lumbar intersection on the same side of the shoulder strap. Repeat the process for the other shoulder strap. Pull the pack tight to your back. Now you can secure the remaining rope around your waist as a belt. To make a quick-release waist belt, tie a trucker’s hitch (watch our video of a trucker’s hitch here at 2:30 mins.) on the belt portion of the rope. Once secured, tuck any remaining rope behind the pack frame. Use your shelter system (tarp, poncho, or other waterproof cover) as the shell. 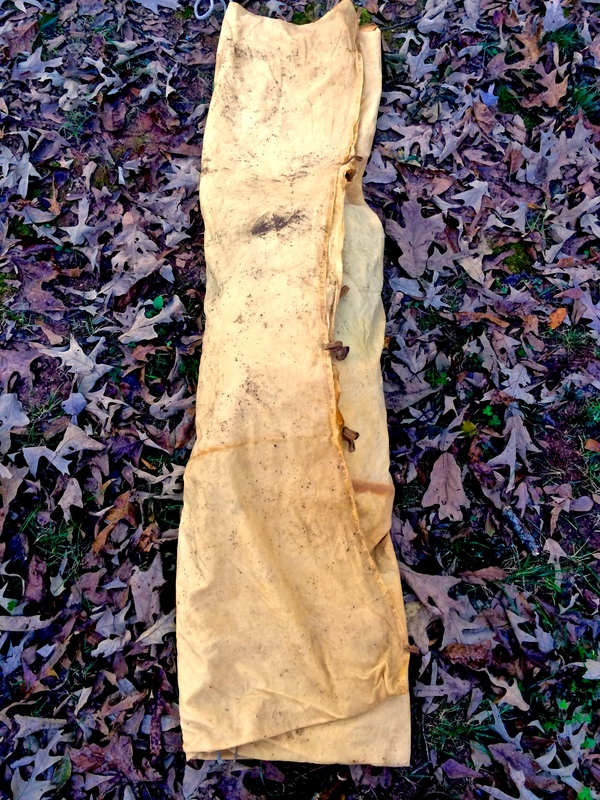 I used my homemade Oil Skin Bed Sheet Tarp. Lay the frame on the ground with the outside facing up. Make sure the loops are to the outside of the frame for easy access. 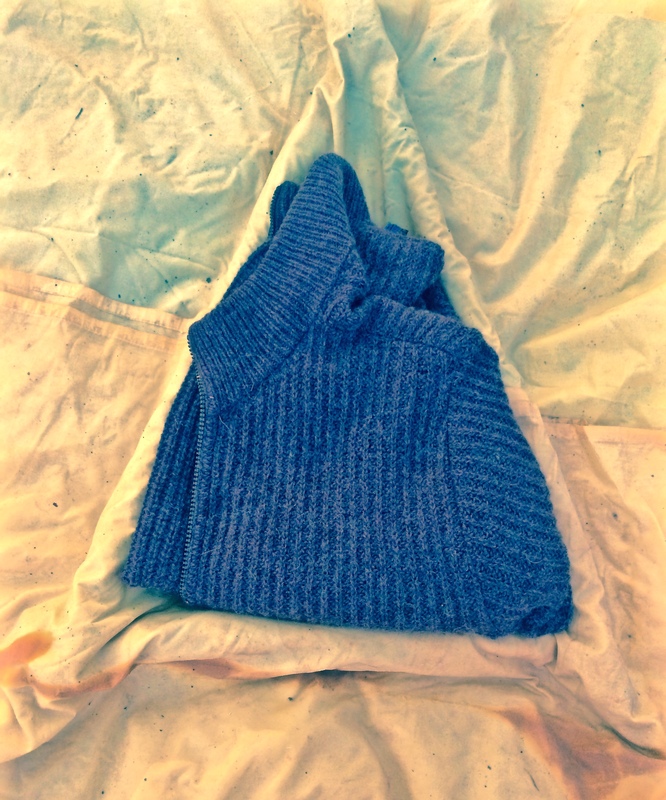 Stuff a sweater or other soft material (sleeping bag) in the triangle so that it protrudes past the frame as a cushion for your back. Now you can add your other items on top of that layer. I pack a dry bag with items I won’t need until setting up camp. 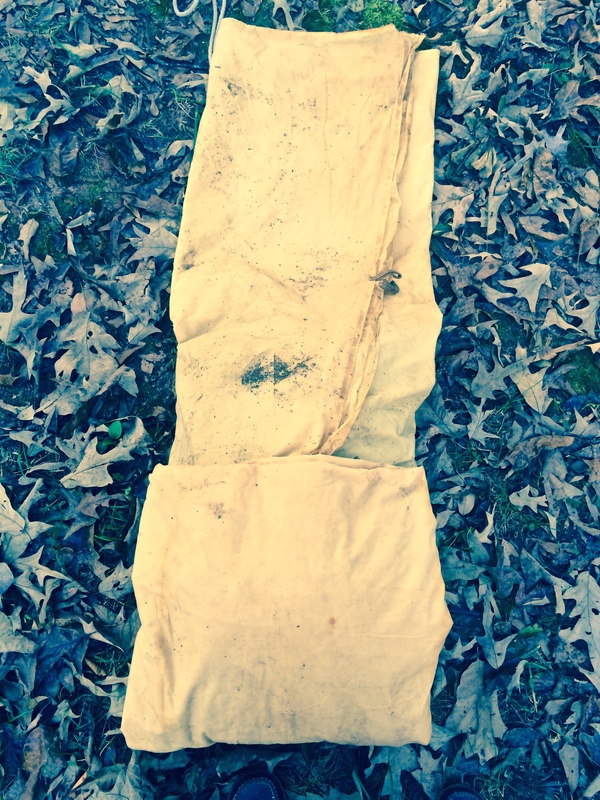 Once your load is ready on top the tarp and frame, wrap the sides of the tarp over the burden. Wrap the bottom of the tarp up and over the sides. 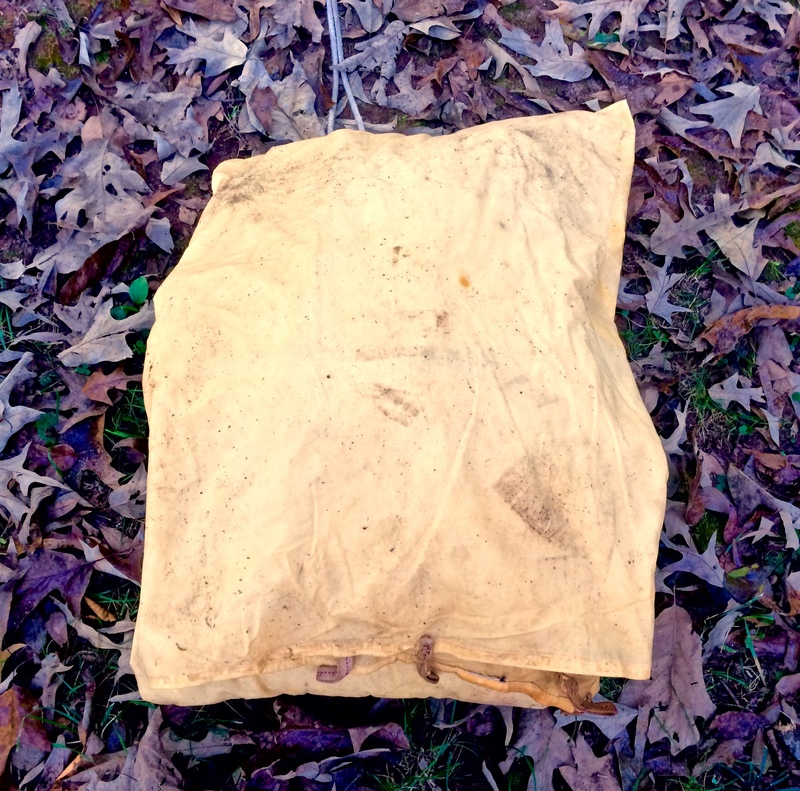 The top of the tarp folds over last like an envelope to shed rain. My shelter uses a 25 foot piece of paracord as the ridge line. Double this cord to form a loop. Place the loop end over one of the upright poles at the top of the A-frame. Run the working end through the loop on the lumbar pole and back around the upright pole. Cinch tight. Begin threading the cordage through the side loops in a crossing fashion to alternate sides of the pack frame, cinching tight on each loop. You may not use all six loops. For larger loads, don’t double the 25 foot section of paracord. 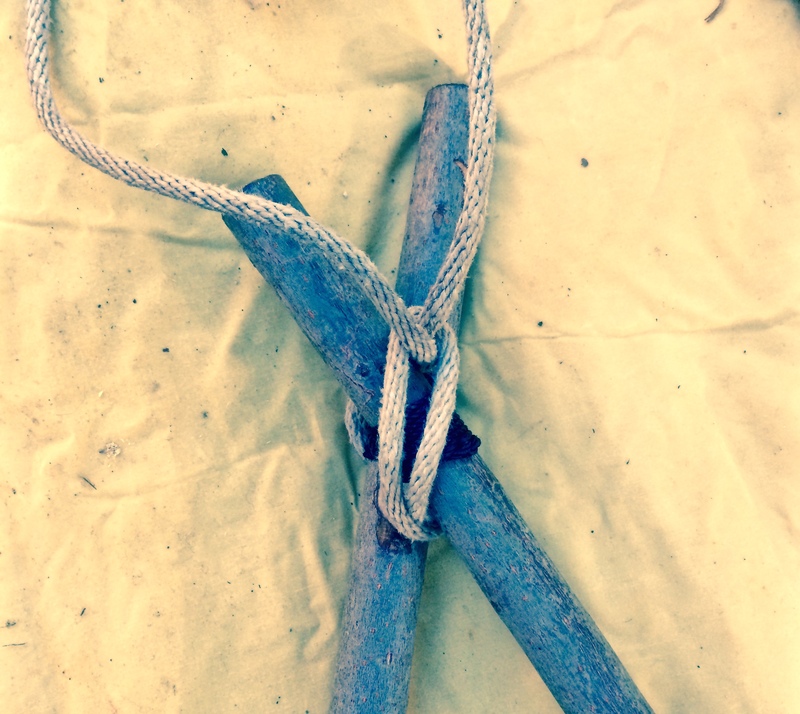 Simply tie a bowline knot on one end and slip over an upright to give you more cordage to secure the load. To terminate the cordage, tie a trucker’s hitch after going through the last loop. This allows a quick release while tightening the load. For a light load, stand behind the upright frame on the ground with the shoulder straps in each hand. Lift the pack up and around your body so that the shoulder straps are in place. Secure the bottom two corners as described in Step #5 above. Tie off the belt securely. You’ll notice that the rope will dig into your shoulder and trapezium muscles. To distribute the load, slide a thin piece of wood under each rope to bridge the gap between your pectoral muscles and shoulders. Prepare these pieces before you lift the pack on your back. External pack frames have played a key role in conveying heavy loads over long distance. 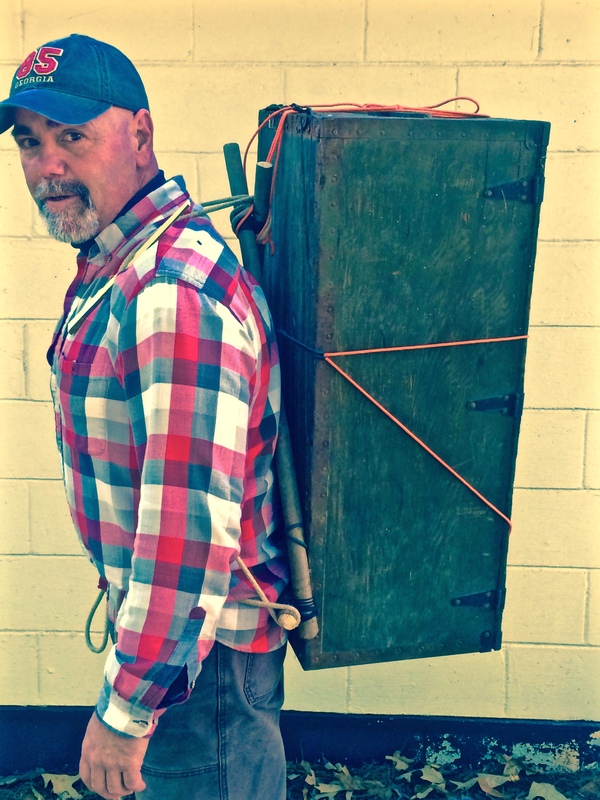 The Roycraft frame offers a lightweight option for anyone needing an improvised backpack. 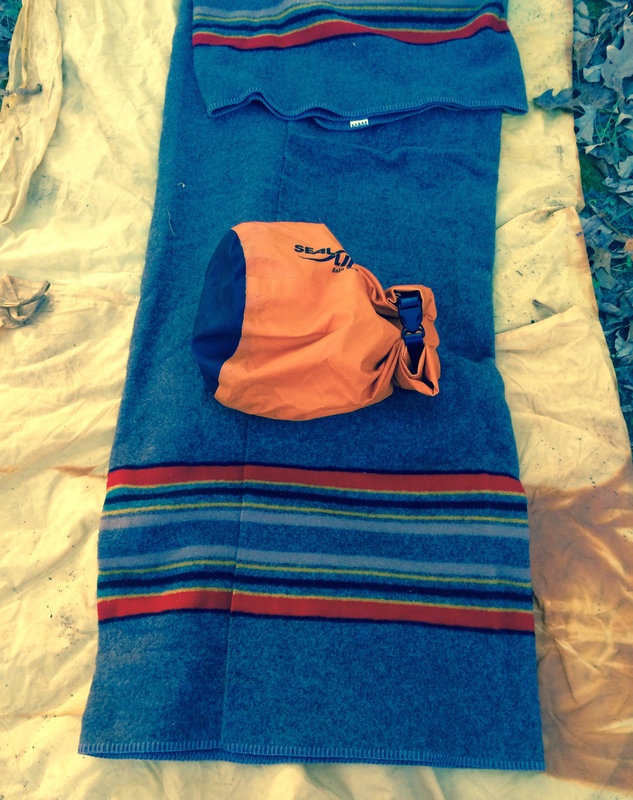 I’m planning to modify my Roycroft frame with padded shoulder straps from an old ALICE pack to be my go-to backpack. Why not? I’ll be able to carry the large stones my rock-loving Dirt Road Girl picks out for her yard collection. Yep, I’m her beast of burden! If you’ve ever built and used a Roycraft pack frame, we’re always interested in learning new tips and tricks to make ours better. Share your knowledge in the comment section or social media. Great Article! You never know when you need a ruck, and this is a great way to get you through whatever. Thank you for taking the time to read and your support, BYP! Un post spettacolare! Thank you again and again Todd! Why don’t write an handbook ? Thanks, brother! I’ve given it some thought in the past. Nice. I want to make one for carrying my metal detecting gear. Thanks for the great information. These simple frames can carry all kinds of stuff. Thanks, Rich!